Increase iPhone storage & remove password solutions. Gadgets fix can now add more memory for your iPhone 6s, 6s plus, 7 and 7 plus from basic memory to up to 256gb while you wait. Gadgets Fix can now remove passwords from any personal iPhone’s. Gadgets fix have launched an new amazing service if your running low on your iPhone 6s,7 and 8 models. Our revolutionary new process increases your iPhones on board memory. No Need for your iCloud fees upgrading or selling your existing phone and save hundreds of pounds by booking your phone in to gadgets fix. You can drop into the store contacting us by quick quote. Gadgetsfix.com have now opened in north leeds with 44 5 star google reviews. Our new store is located in Allwoodley within Slaid Hill news, Slaid Hill Court, Leeds LS17 8TJ. come smaple our warm friendly service from our wonderful partners Shaz and Tariq. Call in now or go to quick quote on our website. Gadgetsfix.com are 4th place in global google reviews in comparison for Apple stores. Gadgetsfix.com are 4th place in global google reviews in comparison with Apple stores. We have the highest rating with 4.4 which is quite outstanding for a small independent store. Apple stores in Paris, Los Angeles, Birmingham Manchester Leeds are behind GadgetsFix.com . Gadgetsfix.com have over 540 Google reviews which is out performing most Apple stores in New York. Gadgetsfix.com is out performing most of the Apple stores in New York for the most google reviews in the last 13 months. Most of the Apple stores are 20 times larger and has 20 times the footfall. Yet Gadgetsfix.com in Leeds West Yorkshire is out performing Apple with the number of 5 star reviews. Gadgets fix also have over 800 Face book 5 star reviews in the last 12 months. Gadgetfix.com is the UK’s number one repair store. Gadgets fix.com hold the record for the most google reviews in 12 months for a small store. Gadgetsfix.com have launched a new Quick Quote and Repair tracker feature on our exciting website. The feature comes with a add photo option where you can send an image of the damage direct to www.Gadgetsfix.com with the inquiry form. Also another exciting feature is Repair tracker where you can get an up to date information on how your gadgets fix is getting on. Its a revolutionary new addition to our www.gadgetsfix.com website. Gadgetsfix.com have reached a milestone with 430 google & 850 Facebook reviews and a 4.2 rating the highest in the world per sq ft. Gadgetsfix.com has achieved this in one year. GadgetsFix.com is now the country’s number one repair center. In Leeds the Apple store with 80, Currys with 34, Carphone with 6 reviews. All these companies offer excellent service and 1000 times the number of clients and with 50 times more floor space compered with Gadgetsfix.com. At GadgetsFix.com. We have the highest ratio of feedback with better ratings which shows we offer the best customer service in Britain. The Apple Store on Regents St London has 517 reviews with a 3.8 rating. The Apple Store on fith avenue busiest street in world has 50 times the floor space, 500% more clients and has been going for 12 years has only 1770 reviews with a 4.3 rating. Gadgetsfix.com with google and facebook reviews of 1200 reviews is out performing the Apple store in New York. Dated 13/07/16. Gadgets fix can replace and repair chips on the board with power, password and graphics issues. We lead the way with new revolutionary techniques. 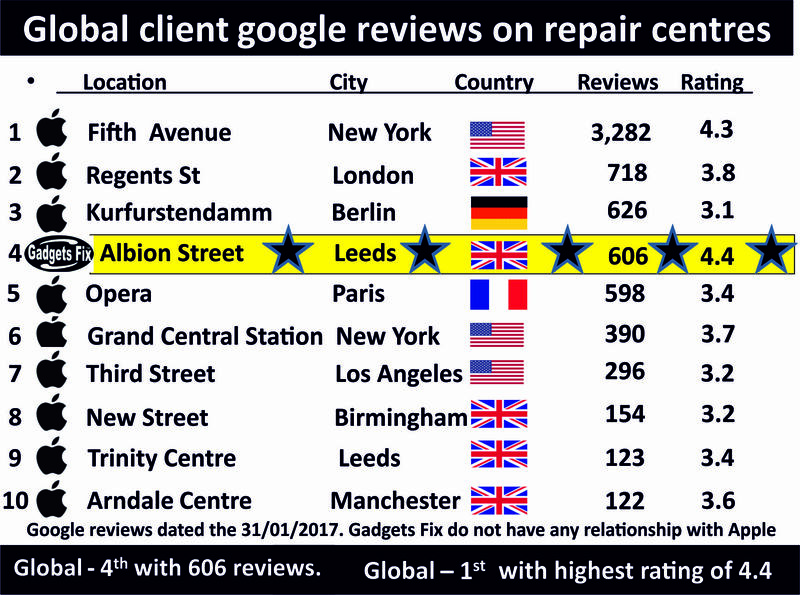 GadgetsFix.com has nearly 350 google reviews the highest in the north for a repairs of iPhones with 95% awarding GadgetsFix.com 5 Stars.